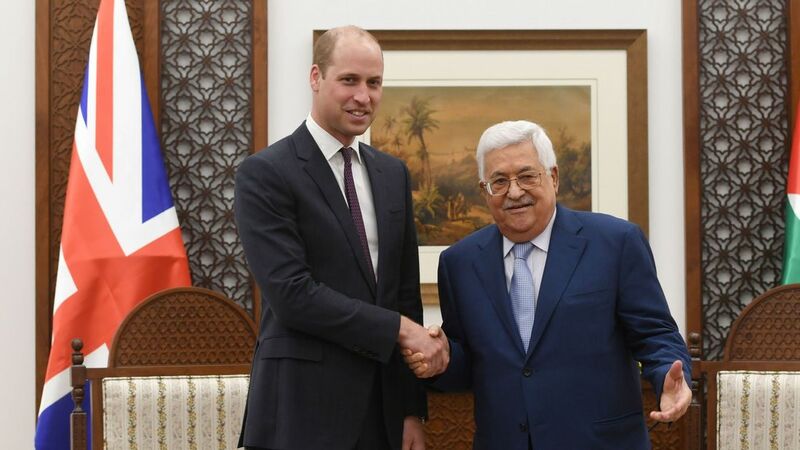 Prince William has spoken of his hopes for a "lasting peace" in the Middle East as he met Palestinian leader Mahmoud Abbas in the West Bank. The pair had talks a day after the royal was asked by Israel's president Reuven Rivlin to take a "message of peace" to Ramallah in an attempt to rekindle relationships with Mr Abbas. The Duke of Cambridge is the first member of the Royal Family to make an official trip to the Palestinian territories on behalf of the British government. Mr Abbas told William he hoped the occupied territories would be a fully independent state the next time he returned to the region. The president said: "I hope this will not be the last visit... that your next visit will be in the state of Palestine when we have our full independence. "Your royal highness, your visit to us will deepen and strengthen the ties between our two peoples." Mr Abbas also pledged his "full commitment to achieving a just and lasting peace based on a two-state solution where the state of Palestine lives side by side with the state of Israel, with both supervising peace and security". 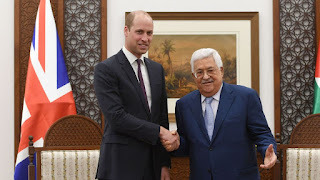 William told Mr Abbas: "I'm very glad our two countries work so closely together and have had success stories with education and relief work in the past, so, long may that continue. "My sentiments are the same as yours in hoping that there is a lasting peace in the region." The duke later visited a Palestinian refugee camp in the West Bank. While there, he went to a UN-run health clinic in the Jalazone camp near Ramallah.